Selections from Chapter 2 of "Dynamite: the Story of Class Violence in America" on the condition of the American working class in the late 19th century, the workers movement including the Knights of Labor and Mayday and the Haymarket martyrs. Such European anarchists as Bakunin, Kropotkin and Guillaume, living in London and the Jura, had been keeping their eyes on the United States for years, as a possible fertile field for anarchist propaganda and action. Indeed, Bakunin, upon hearing of hunger parades in New York and elsewhere, was thinking of going to America as early as 1874, but affairs in Europe and his ill health, which presently resulted in his death, kept him from making the trip. Now, in the summer of 1877, receiving reports of the battles in several states, they were all filled, as Guillaume put it, “with a lively emotion”. In the Bulletin of the Jura Anarchist Federation, Kropotkin immediately published a lengthy review of the riots. He was enthusiastic in his praise of the “revolutionary qualities” which the American proletariat had exhibited. “Its spontaneity, its simultaneousness at so many distant points, the aid given by the workers of different trades, the resolute character of the uprising from the beginning, call forth our sympathies, excite our admiration, and awaken our hopes”. Then, in 1882, Johann Most, a German anarchist, arrived in the United States and became the chief exponent of the ideas of Bakunin, Nechayeff and other European ‘propagandists of the deed’. But first it is necessary to know something of the radical movement in the United States prior to the riots of 1877. Modern American radicalism dated from the late 1840s, when the country began to receive numerous political refugees from Europe, especially from Germany, following the upheavals there in 1848. They represented the socialism that was being crystallized in the mighty literary efforts of Marx and Engels. They were not of the underdog element, but rather the élite, the intelligentsia of immigration. The movement was intellectual, refined, tame, romantic. It was, for about two decades, a vague expression of a multiplicity of ideas aiming at the introduction of drastic social reforms, the basic one of which was a reconstruction of the economic scheme so that the entire wealth of production should accrue to the producer. They did not mean to abolish capital, but to do away with a distinct capitalist class, though, of course, no one had a plausible notion of how that might be accomplished in the United States. The movement was a babble of voices in which the most strident note was the wail of discontent. In the 1850s, numerous German-American revolutionary societies and educational clubs were formed in New York City, Baltimore, Philadelphia, Chicago and other large cities, aiming to start a revolution in the minds of the people. Barricades and violence played no part in the thought of the overwhelming majority of the socialists of that day. They were opposed to lawbreaking, holding with Marx and Engels that such tactics were injurious to the cause. After the civil war, and even during that conflict, marxism had begun to appeal - vaguely - to some of the more thoughtful native Americans whose energies were not entirely absorbed by the exploitation of the country and their fellow citizens. Abraham Lincoln himself became - not too publicly, of course - a sort of socialist. Serious-minded people were disturbed by the rise of influences affecting the vitality of the government. As guardians of public order and morality they were also disturbed by influences affecting individual social conscience. There was little interest in politics and government from the broader viewpoint of social welfare or civic patriotism. Under the sway of the passion for material success which had taken hold of the country, honesty and social intelligence vanished from public life. Honest politicians fled or were driven from official positions. The influence upon the government of one unconscionable millionaire outweighed the votes of a million common people. Except for the frontier, fair play had ceased to be a vital quality of American public life. All this outraged the sensibilities of many people. Beneath the roar and bustle of industrial America there was an undercurrent of ideas, hopes and fitful strivings to restore the government to social interests and to extend its power for public welfare so as to include the lowest worker. Throughout the 1860s, socialism remained tamely idealistic, polite, refined, intellectual, almost respectable. Its appeals were not addressed to the underdog element as such, but to all classes. There were a few hotheaded, wild-eyed radicals here and there, but while industrial conditions were yet bearable to the majority of workers and the frontier was still open, they received little attention. Then, with the panic of 1873 bursting upon the country, there followed the conditions described in the preceding chapter and, almost overnight, the socialist movement lost its genial, intellectual temper. The hunger parades in the terrible winter of 1873-1874 were organized by socialist leaders, both native and foreign-born, and thenceforth socialism was largely - almost exclusively - an underdog, belly-hunger movement. As such, it naturally became emotional and violent. It was seized by the desperation of the hungry mob. The most radical city in the United States in the 1870s and 18805 was Chicago. The Socialist Labor Party of Chicago, whose early career was linked with the bloody events that occurred during the panic, acted under the energetic leadership of such men as Philip Van Patten, Albert Parsons and G A Schilling - strike tacticians and agitators of exceptional ability. Almost from its inception, the Socialist Labor Party contained an extremist element. From time to time, some of its leaders despaired of accomplishing anything for the working class through politics. They were acquainted with marxist ideas, but they also read Hegel, Kropotkin, Bakunin, Alexander Herzen and Spencer. In addition to the SLP, they were organized in the so-called revolutionary clubs, meeting in secret halls and beginning to despair of starting ‘a revolution in the minds of the people’. Similar clubs appeared in other cities during the panic. In 1881, a national convention of the revolutionary clubs was held in Chicago and the Revolutionary Socialist Party came into existence, competing with the SLP. For a year and a half the character of this movement was very vague. There was loose talk of violence, dynamite and assassination, but the party as a whole dangled self-consciously between marxism and nihilism, between theory and action. Then Johann Most came. He was a man in his late 30s, an intense, striking personality, somewhat of a Bakunin even in looks; possessing a fiery intelligence and violent temperament; largely self-educated, dynamic, irrepressible; with a picturesque prison record as a result of his revolutionary doings in Vienna, Berlin and London. In London, on the occasion of the assassination of Tsar Alexander II by the Russian nihilists in 1881, he had published, in his paper Freiheit, an article extolling the act and urging others to do likewise with rulers everywhere. For this he had been sentenced to 18 months of imprisonment. After serving the term he departed for the United States. In America he was hailed as a hero by the comrades of the revolutionary clubs and became at once the leader of the extremists. His cry was: “Extirpate the miserable brood!” - meaning all politicians and exploiters of the masses. He was an avowed, thoroughgoing revolutionary. His principle of action was the Bakuninist principle: “Let us rely upon the unquenchable spirit of destruction and annihilation which is the perpetual spring of new life. The joy of destruction is a creative joy!” Most believed in dynamite and street-fighting and, in his contentions with the nonviolent American socialists, made no secret of his belief. He was a frequent visitor in Chicago, where violent revolutionary doctrines and tactics gained a considerable following among workers and their leaders. Under Most’s influence, Die Arbeiter Zeitung, a socialist paper, turned out-and-out anarchist. He resumed the publication of his own Freiheit; a group of Czech anarchists began a sheet in Bohemian; and for English-speaking anarchists, Albert Parsons, who, along with many other Chicago agitators, had accepted Most’s ideas and leadership, edited Alarm. Soon after his arrival in the United States, Most published in New York a booklet entitled Science of Revolutionary Warfare - A Manual of Instruction in the Use and Preparation of Nitroglycerine, Dynamite, Gun-Cotton, Fulminating Mercury, Bombs, Fuses, Poisons, etc, etc. In 1885 and 1886 chapters of the book were reprinted in anarchist sheets in Chicago and Cleveland, which, in addition, carried inflammatory editorials, appeals, and manifestos. [8 April 1885] Here is something worth hearing. A number of strikers in Quincv, yesterday, fired upon their bosses, and not upon the scabs. This is recommended most emphatically, for imitation. [5 May 1885] Workmen ought to take aim at every member of the militia, and do with him as one would do with some one of whom it is known that he is after taking one’s life. It might then sooner be difficult to obtain murdering tools . . . Workmen, arm yourselves! [18 March 1886! If we do not soon bestir ourselves for a bloody revolution, we cannot leave anything to our children but poverty and slavery. Therefore, prepare yourselves! In all quietness, prepare yourselves for the revolution! Dynamite! Of all the good stuff, that is the stuff! Stuff several pounds of this sublime stuff into an inch pipe (gas or water pipe), plug up both ends, insert a cap with a fuse attached, place this in the immediate vicinity of a lot of rich loafers who live by the sweat of other people’s brows, and light the fuse. A most cheerful and gratifying result will follow. In giving dynamite! To the downtrodden millions of the globe science has done its best work. The dear stuff can be carried in the pocket without danger, while it is a formidable weapon against any force of militia, police, or detectives that may want to stifle the cry for justice that goes forth from the plundered slaves. It is something not very ornamental, but exceedingly useful. It can be used against parsons and things. It is better to use it against the former than against bricks and masonry. It is a genuine boon for the disinherited, while it brings terror and fear to the robbers. A pound of this good stuff beats a bushel of ballots all hollow - and don’t you forget it! Our lawmakers might as well try to sit down on the crater of a volcano or on the point of a bayonet as to endeavor to stop the manufacture and use of dynamite. It takes more justice and right than is contained in laws to quiet the spirit of unrest. The story of dynamite - the actual ‘stuff’ - in the United States, as a weapon of the have-nots in their warfare against the haves, dates from Most’s arrival in the country. Many of the factors that factors that finally led to the explosion of the Haymarket bomb in Chicago had been in operation long before Johann Most’s arrival. The intense public reaction to the Molly Maguire outrages and the riots of 1877, as already suggested, had an unhealthy immediate effect upon working class organizations. The few strikes that occurred between 1878 and 1880 were promptly and brutally put down by the police, the militia, and hired gunmen. But the union movement was much too elemental and primal, too powerfully motivated by the belly-hunger of a great mass of people, by the desires of individuals to get on, by the prevalent spirit of America, to be kept down for long by the self-righteous condemnation of the pulpit, the conservative press, the respectable mob at large, or even the police clubs and the fire of the soldiers and the gunmen. The workers’ living conditions became worse. Immigrants continued to pour into the country by the hundreds of thousands every year, expanding the slums working for less than the native workers were willing to take. “In the cities”, says Mother Jones, in her Autobiography, “there was hunger, and rags, and despair”. Within a year or two - at any rate by 1880 - it began to appear that the riots and the subsequent reaction, which included the hasty building of new weapon stores and general tightening up of capitalist lines against the working class, had given the wage earners of the country a new and powerful impulse to organization. The fact that whole regiments had been called out to subdue them stirred in the workforce a resentment which began soon to assume vague political aspects and prompted its leaders to think of organizing the unskilled workers whose part in the riots had been so startling and important. Many of the old unions were reorganized and numerous local amalgamations were effected. But the most important working class bodies at that time were certain secret societies whose initiation rites were absurd, fantastic ceremonials conducted by magniloquent officers with high-sounding titles, and whose members recognized one another by elaborate signs and secret passwords. Of these, the most significant was the Noble Order of the Knights of Labor, founded in 1869 by a Philadelphia garment-cutter, Uriah S. Stephens and six of his fellow craftsmen. Stephens has been described as “a man of great force and character… with love of books… and feeling withal a strong affection for secret organizations, having been for many years connected with the masonic order”. He had associated with radicals, some of them German refugees of 1848, and from them had acquired a few vaguely socialistic ideas that fitted into his natural but even vaguer humanistic idealism. The principles of the K of L were set down by Stephens in the secret ritual. “Open and public association having failed after a struggle of centuries to protect and advance the interest of labour, we have lawfully constituted this assembly” and “in using this power of organized effort and co-operation, we but imitate the example of capital heretofore set in numerous instances”; for, “in all the multifarious branches of trade, capital has its combinations, and, whether intended or not, it crushes the manly hopes of labour and tramples poor humanity into the dust”. The K of L, however, meant - timidly, carefully - “no conflict with legitimate enterprise”, whatever that was, and “no antagonism to necessary capital”. It meant, rather, “to create a healthy public opinion on the subject of labour. . . and the justice of its receiving a full, just share of the values, . . it has created”. For three years the Order was a garment cutters’ club, its membership remaining less than one hundred. In 1872, several ship carpenters, plumbers and other workers were allowed to join, and thereafter it expanded rapidly into a national organization. The secrecy and ceremonials appealed to them and within the lodges were numerous official positions with magnificent titles and uniforms. Grand Master Workman Stephens - for such was his title - declaimed sonorously about ‘justice’, ‘the nobility and dignity of labour’, ‘the great brotherhood of toil’ and hinted at the evil doings of the capitalists. But his successor, Terence V Powderly, a machinist by trade, who was elected grand master workman in 1878, cut a still more absurd figure in the national workers’ movement. He excelled even Stephens in vague social idealism, love of abstract words and bombastic oratory. A windbag, a figure of lath and plaster, vain and jealous, loving power, never knowing his own mind, he was blown hither and thither by the force of events. He had an expansive manner and held that ‘labour was noble and holy’, was opposed to ‘wage slavery’, as he boldly called it, but looked with deep disapproval upon the strike as a method to fight it. His ignorance of the forces inherent in modern industrialism was abysmal. He spoke grandiosely on all sorts of subjects, night and day. The man was full of strivings and gropings, a valorous idealist on the platform, but timorous when action was suggested. The K of L was essentially an assembly of windbags, full of half-hearted revolutionary impulses and crude chicane, affording those like Stephens and Powderly, who loved to hear themselves talk, an opportunity to orate and receive the applause of simple workers, in whose capacity to help themselves as a class they had no intelligent faith. Nearly everything that the K of L achieved in the course of its dramatic career was achieved in spite of its leaders. During Stephens’ regime the order was entirely secret; not even its name was known to outsiders. Its meeting-halls and gathering places in the forests, and its official announcements in the press were indicated, romantically, by five stars. People would see the mark appear on the door of some auditorium and then hordes of workers would come flocking there. What were they up to? How strong was this mysterious order of the five stars? The conservative, respectable mob, to say nothing of the capitalists, made uneasy by the upheavals of the proletariat in Paris and their famous Commune of 1871, by the Molly Maguire disclosures, and by the riots of 1877, feared that the organization might be dangerous. Suddenly some fateful day a bloody terror might burst upon the country! Finally, the press and the pulpit began to demand that the ***** come out in the open and announce their aims. Powderly was a politician, a self-seeking, self-conscious public character, sensitive to public opinion. So, in 1878, under his leadership, the order complied with the demand, and the public was informed that the K of L were eager to “enjoy the blessings of life” and that their battle-cry was “Moral worth, not wealth, Is the true standard of individual and national greatness”. Powderly spoke pretentiously of ‘uplift’ . . . ‘ideals’ . . . ‘principles’. Notwithstanding Powderly’s and his cronies’ opposition to strikes as a means of gaining for the working class a greater share of industrial profits, numerous walkouts, big and small, occurred the country over, commencing in 1880, when conditions began slowly to improve after the dire effects of the panic. The K of L leaders, so-called, were forced to make concessions to strong elements within the order which insisted upon action. Most of the K of L strikes, however, as well as others of that period, were unsuccessful because dishonestly or incompetently led. A typical K of L strike in the early years of Powderly’s regime was that of the telegraphers, in 1883. They had organized nationally and become affiliated with the K of L the year before, The impulse for the movement came from below, strong enough to overcome the objections of the timorous general officers, conscious of their inadequacy. The walkout occurred on 19 June against all commercial telegraph companies, of which lay Gould’s Western Union, employing some 4000 operators, was the greatest. The workers demanded one day off in seven, an eight hour day shift and seven hour night shift, and a rise in wages. The strike was a national affair, a topic on the floor of the United States senate. Jay Gould was just then in deep trouble with the public for his over-contemptuous attitude toward it, and a large portion of the press gave its support to the strikers, not with any real feeling for the justice of their cause, but rather to cater to a public prejudice. The country was once more reminded of the existence of the ‘labor’ problem. But the blacklist was already a well-developed method of the capitalists to subdue the workers. In this instance, the Western Union and other companies employed the mere threat of it successfully, Frightened, one by one, the strikers returned to work on the old terms, and by the end of July the strike was a dead failure. There had been no leadership, no discipline, no adequate strike fund. In the early and middle 1880s there were numerous minor disturbances all over the country, for the most part spontaneous outbursts of badly organized, practically leaderless workers. Yet, in the midst of all the failures, there appeared occasional signs that by and by organized workers might become effective. Of the few successful strikes, the most notable were the K of L railroad strikes in 1885, On 16 February of that year, Jay Gould’s Wabash road announced a 10% cut in the wages of its shopmen, Other Gould companies had preceded the Wabash with similar announcements. Within two weeks, close to 5000 shopmen struck on three Gould lines. The engineers, brakemen, firemen and conductors declared themselves in sympathy with the walkout and seemed ready to translate their sympathy into action. The wage cut did not go into effect; the workers won the strike. The following summer, however, the Wabash discharged a large force of K of L shopmen, which amounted practically to a lockout, in direct violation of the agreement that had ended the strike in the spring. The K of L then ordered a boycott of the Wabash rolling stock, which, had it been put into effect, would have disorganized over 20,000 miles of railways, The boycott was by this time an effective weapon in the hands of workers to which even the K of L uplifters did not object very strenuously. Jay Gould took alarm; the terrible riots of ‘1877 were still fresh in his mind, Before matters had gone much further, he hastily invited the K of L railway men’s leaders to a conference with the managers of his roads, at which he lent his support to proposals to yield to the unions. The unions recalled the boycott order, and in the final settlement the Wabash made several concessions to them. There was something intensely dramatic and spectacular in this first important victory. Immediately after it, there began a veritable stampede of the loose toiling masses to join the K of L unions. The membership of the order increased so rapidly that the general officers, fearful lest the organization should become so huge as to be utterly unmanageable, began to refuse charters to new locals. Among the new members were tens of thousands of unskilled and foreign-born workers. The press of the country, both radical and reactionary, helped blindly to exaggerate the significance of the victory, little dreaming that within a year it would lead to troubles almost as great as, and more significant than, those of 1877. Meantime, radical ideas were spreading in America. The most widely read book in the 1880s was Henry George’s Progress and Poverty. In three years it went through more than a hundred editions and George’s analysis of the economic and social conditions was discussed before workers’ groups, in colleges, from pulpits. Every mill in town is making money. . . but the operatives travel in the same old path – sickness, suffering, small pay. The struggle for existence is daily becoming keener, and the average wage-laborer must practice the strictest economy, or he will find himself behind at the end of the season… The men’s remuneration because of female and child labor competition has been reduced to such an extent that only with the aid received from other members of the family are they able to keep the wolf from the door… Children are occupying the places of adult labor here. Grinding poverty is a very general cause of prostitution. The prominent fact is that a large number of operatives and domestics earn such small wages that a temporary cessation of business, or being a short time out of situation, is sufficient to reduce them to absolute distress, and it becomes a literal battle for life. The American laborer must make up his mind, henceforth, not to be so much better off than the European laborer. Men must be content to work for low wages. In this way the workingman will be nearer to that station in life to which it has pleased God to call him. The union movement - the K of L, the independent trade unions, and the railway brotherhoods - looked formidable numerically. Actually, with such leaders as Powderly, it was anything but effectual. Its ideas were crude, undeveloped. It was, like every other movement in America at that time, chaotic, utterly lacking in statesmanship. This lack is apparent throughout the history of the K of L. When unemployment was general, for instance, the K of L leaders, in an effort to decrease it, officially urged the workers to break beer and milk bottles after emptying them and thus increase employment in the glass industry. This, incidentally, was one of the first cases of sabotage propaganda in America. Thousands of workers, many of whom were members of the K of L or of regular trade unions, gathered in secret meetings, at which extremists inflamed their minds and emotions, and attended shooting practice in the woods, preparing themselves for the big war on the open job market their necessity impelled them to struggle ceaselessly against members of their own class, but at these underground meetings the idea was impressed upon them that they could obtain redress for their wrongs only as they compelled it by violence. Capitalists used force in keeping down the proletariat; therefore the proletariat was obliged to resort to force. Behind this extremist attitude were the abnormal, desperate impulses born of starvation and abuse. In the mid-1880s, as I have suggested, Chicago was the heart of extreme radical propaganda in the United States - and with good reason. Nowhere in America was the capitalists’ contempt for the public interest stronger than in Chicago - for folk who had failed to make big money in general, and for the working class in particular. In no American city was class demarcation sharper, nor, it may be added, did the press anywhere else more vehemently uphold to such extremities the sacred rights of property. The Chicago rich were notorious for their debauchery. After the great fire in 1871, which destroyed the city, the more sanctimonious citizens of Boston and Philadelphia declared that the flames had been sent as a judgement from on high upon a modern city of the plain. Preachers likened it also to Babylon, Tyre and Pompeii. In the rebuilt, booming city the manners of the rich were unchanged. In the late 1870s and the early 1880s, the militant radicals of Chicago .WI clung to political action as a possible means of improving the conditions of the underdog. In municipal campaigns they managed, now and then, to send one or two men to the city council, though of course their presence there was ineffectual. Then, in the election of 1885, the Socialist Labor Party was badly defeated, losing all representation in the city’s political life, with the result that the extremists in the movement became even more rabid and violent. . Thenceforth anarchism was definitely a growing movement in Chicago. The active membership of the anarchist clubs perhaps never exceeded 3000, surely a small number in a community of 850,000, but among the leaders were picturesque, intense men - Parsons, August Spies and Michael Schwab of Die Arbeiter Zeitung; Samuel Fielden, an ex-Methodist minister; Oscar Neebe, organizer of the Beer Wagon Drivers; Adolph Fischer, a printer; George Engel, a toy maker; and, to mention but one more, Louis Lingg, organizer of the Carpenters’ Union. They talked much of the revolution, dynamite, human rights, justice, firearms, liberty, arson, and received much sensational publicity in the big conservative newspapers, which referred to their agitation as ‘the menace’. To some of these men dynamite was little more than a word, a vague symbol of people’s uprising; to the others - Lingg, for one - it was the real stuff. Reading The Tribune, The Times and The Daily News, the general public was, of course, alarmed. The community developed a state of mind not unlike the Bolshevik scare that gripped the United States after the first world war. Soon every radical, no matter how mild his or her views actually were, was considered an anarchist, just as 40 years later everyone who held notions not endorsed by the Ku Klux Klan, the American Legion, and the Daughters of the American Revolution, was branded a ‘bolshevik ‘. With the industrial depression in 1884-1886, the situation was intensified. Tens of thousands were unemployed. There were hopeless strikes, wage cuts, lockouts… misery. And agitators were busy. “The workers”, writes Mother Jones, “asked only for bread and a shortening of the long hours. The agitators gave them visions. The police gave them clubs”. The feelings on both sides ran high. The Tribune, according to Mother Jones, “suggested… that the farmers of Illinois treat the tramps - unemployed workers that poured out of the great industrial cities - as they did other pests, by putting strychnine in their food”. After the K of L victory over the formidable Jay Gould, there was, as I have said, a veritable rush on the part of unorganized workers to join the unions affiliated with the order. The conservative press, as I have also mentioned, helped to bring this stampede about by exaggerating the significance of Gould’s defeat. The situation had slipped entirely out of the hands of Powderly and other big officials. Some trade unions not affiliated with the K of L had decided, in 1884, to start an intensive campaign for the eight hour working day. Subsequently, 1 May, 1886 was fixed as the day on which it should be put into effect. As the day - der Tag - approached, the movement gained in volume and determination, especially after the railway men’s momentous tiff with Jay Gould. This was true not only in Chicago, but all over the country. Eight hour leagues were formed in the cities and huge rallies conducted through the fall and winter of 1885 and the early spring of 1886. The anarchists at first viewed the eight hour movement with scorn, insisting that it was useless to demand anything from the capitalists; the thing to do was to arm the working class and “take over the whole damn system and change it”. But as the movement became the all-absorbing topic of the proletariat, they - Parsons, Spies, Schwab, Fielden, and other ultra-radical orators and publicists - joined and, with their talents, soon became the outstanding, if not the most popular, agitators of the cause. And, my friends… the laboring classes constitute the bulk of our population, and it will be an unhappy day for this country when any great numbers of them become ‘fire and blood’ socialists [i.e. anarchists]. But many things in these days are driving them and drawing them that way… The country at large would be horrified to see, in plain English, the utterances which are daily circulated by socialist journals among the laborers in our great cities… And there are other tokens then the noisy threats and appeals of the Socialists. The laboring men have awakened to the power of organization. They have begun to assert themselves where recently they only complained, or were silent… a power which suddenly dares to measure swords with a railway millionaire like Jay Gould has sprung up. It is growing. It declares its purpose to continue to grow. The eight hour agitation continued all winter throughout the country. In Chicago, the anarchists ran the whole show. They held meetings on the lakefront, their crowds consisting mostly of jobless, hungry men, many of whom had no place to sleep. The red flag was displayed at these rallies, the speakers explaining that it was a ‘symbol of the people’s revolutionary spirit’. Then the black flag appeared, ‘symbolical of poverty and hunger of desperation’. Parsons and Fielden were the most popular speakers. They denounced the Chicago board of trade (‘the board of thieves’) which had recently dedicated its new $2,000,000 building (‘the temple of usury’) while 2,500,000 men were jobless in the United States. More than 1000 members of the so-called Lehr-und-Wehr Vereine drilled with rifles in secret halls and practiced shooting in the woods. At the same time the employers were meeting in George M Pullman’s residence, or in the office of Wirt Dexter, Chicago’s foremost corporation attorney, to discuss the sinister eight hour movement, ‘the damned anarchists’ and what they could do about it all. The public at large was torn between a vague, distant sympathy for the hard-pressed proletariat and the fear that within the mobs of those sullen-eyed, rough-looking people, jobless and homeless, most of them foreign-born, there lurked something awful and gigantic; and the people shuddered in their homes, their offices, their pews. Carter H Harrison was mayor of Chicago, serving his fourth consecutive term in office. He was rich and fat, wore silk underwear, hobnobbed with the town’s wealthiest figures, but at the same time consistently stood up, in all sincerity and in the face of great opposition, for the rights of the underdog. He loved the plain people and enjoyed their affection. He was in sympathy with unions and insisted on having a wide-open town because it was good for business. He believed in freedom and, as a gesture in that direction, appointed radicals to minor offices. He loved Chicago; the city was his ‘bride’, who, he said, “laves her beautiful limbs daily in Lake Michigan and comes out clean and pure every morning”. The mayor tried his best to lessen the tension that had gripped the city during the eight hour movement. He declared that he would not allow troops to be brought in to slaughter workers, insisting that they, too, were citizens of Chicago. But he was practically the only sane man of any influence in town; everybody else had gone mad. The business leaders in the city were too panicky to listen to reason; they believed the agitation had already proceeded too far. It must be stopped. The Tribune printed Articles and letters from its subscribers urging the authorities to break up the workers’ meetings with gunfire - and, if necessary, with dynamite! Everything seemed to conspire to bring the crisis to a head. The winter was a severe one, causing fearful suffering among the poor. The mayor and charitable institutions opened soup kitchens, but this was a mere drop in the bucket. Gaunt, ragged men and women paraded the streets carrying red and black flags, and the police often dispersed them, kicking and clubbing them, contrary to Mayor Harrison’s orders. The police, obviously, received their orders from other sources. He who submits to the present order of things has no right to complain about capitalist extortion, for order means sustaining that; and he who revolts… is a rebel, and has no right to complain if he is met by soldiers. Every class defends itself as well as it can. A rebel who really puts himself opposite the mouth of the cannons of his enemies, with empty fists, is a fool. The police and soldiers… must be met by armed armies of workers… Arms are more necessary in our time than anything else. Whoever has no money, should sell his watch, if he has one, and buy firearms. Stones and sticks will not avail against the hired assassins and extortionists. It is time to arm yourselves! Winter passed and the big day - der Tag, the first of May - drew near. The employers were determined that they would yield no more concessions. The eight hour idea must be fought. Jay Gould had been a damn fool to recognize the unions! They would crush the unions and, run their factories on the open shop basis. Accordingly, in February the McCormick Reaper Works locked out hundreds of union members and hired scabs and 300 Pinkerton detectives - gunmen - to protect the scabs. This was one of the most important immediate factors in rousing proletarian bitterness, and the agitators, naturally enough, stressed the situation for all it was worth. I say we must resist these monsters [i.e., the capitalists and their hired gunmen]. We must fight them with as good weapons, even better than they possess, and therefore, I call you to arms!… The first of May is coming near. You must kill the pirates. You must kill the bloodsuckers… Our work is short; we do not want a thirty years war. Be determined! Parsons, Fielden and Schwab held meetings near the McCormick Reaper Works. Minor riots occurred every few days. The situation was extremely tense. On one side, hunger and desperation; on the other, greed and fear. Bravely forward! The conflict has begun… Workers, let your watchword be: No Compromise! Cowards to the read! Men to the front! The die is cast! The first of May is here… Clean your guns, complete your ammunition. The hired murderers of the capitalists, the police and militia, are ready to murder, No worker should leave his house in these days with empty pockets. The thronged streets were full of whispers. Almost at the last moment the executive body of the Knights of Labor in Chicago had withdrawn its endorsement of the general strike on 1 May for the eight hour day. Such men as Powderly had become frightened by their own power; besides, everybody was saying that the movement was ‘anarchistic’ and ‘foreign’, and they certainly were no anarchists, nor foreigners. The public was in suspense. Some of the men in the streets looked desperate. There was some talk that the anarchists intended to bomb the police stations and exterminate the whole force. But nothing terrible or decisive happened on the first or the second of May. On that day the locked-out McCormick employees held a mass meeting near the works. They were desperate. August Spies was speaking to the mob about the eight hour movement when the factory whistle blew and out came the scabs, done with the day’s work. BLOOD! Lead and powder as a cure for dissatisfied workers – This is law and order! … In palaces they fill their goblets with costly wines and pledge the health of the bloody banditti of law and order. Dry you tears, you poor and suffering. Take heart! Rise in your might and level the existing robber rule in the dust! In the evening some 3000 men, women and children gathered in the square. Mayor Harrison, much disturbed, was there. His bride, it seemed, was having a fit. He waddled nervously between the square and the nearby police station, where a small army of officers waited in readiness. He mingled with the ragged, sullen-eyed proletarians, striking match after match without lighting his fat cigar. He explained to a friend: “I want the people to know that their mayor is here”. Some of the men wore dark looks, but to the mayor the meeting seemed tame. The speeches were not violent. Parsons discussed economics. Drops of rain fell. Overhead were dark, threatening clouds; a sharp wind blew from the lake. People were beginning to go home, lest they be caught in the storm. At 10pm Mayor Harrison, chewing his unlit cigar, waddled back to the station house and there remarked to the inspector in charge: “Nothing is likely to occur to require interference”, and went home. But less than 15 minutes later, the inspector ordered one of his subordinates to turn out the entire force - 176 officers - and march to the square and order the meeting to disband. Palpably, the inspector had orders from someone more powerful in the police department than the mayor; from someone, no doubt, who wanted a riot. It rained. The crowd had dwindled down to about 500 people, mostly men, The meeting was anything but a success. Then he saw the army of policemen marching to the square. Coming within a few feet of the crowd, the captain in command called “Halt!” - and, with drawn sword, advanced towards the speaker. A moment of intense silence; only the sharp wind from the lake swished through the crowd and the police ranks, driving the rain in their faces. Another spell of silence. Few in the crowd knew what was going on. Then - suddenly - a blinding flash, a cloud of grey smoke - a terrific detonation, a sickening smell. . . . Someone - possibly an anarchist, probably a hired racketeer - had hurled a bomb from the alley a few feet from the speakers’ stand, just off the right flank of the police detachment. Confusion. Firing started. Policemen were shooting at the crowd and at one another. They could not see for the smoke. The workers returned fire and the square was immediately strewn with bodies. Then the police reformed and made a charge on the workers. The latter yelled and groaned, trying to escape the volley of the enraged officers. Some were dragging their dead and wounded friends and relatives with them. All this happened in two or three minutes. On the side of law and order, 67 policemen were wounded. Seven of them died. The workers’ casualties were perhaps twice, possibly three times, that many; the number has never been determined. Several seriously wounded workers were taken to the station house along with the dead and injured policemen, but the majority of them were cared for and carried off by relatives and friends. The following day it was evident that Chicago had neglected to “lave her beautiful limbs in lake Michigan”. She was stunned, horrified, crazed. The pages of The Tribune, The Times, The Doily News shrieked and howled. For the first time dynamite had been used in the United States for the destruction of human life. The papers reported that the city was being ‘combed’ for anarchists, which included practically everybody who had any active sympathy for workers. Several hundred arrests were made. The police raided radical newspaper offices and hang-outs. The authorities, it seemed, were determined to make an example of the leaders of ‘black terror’. The editorial writers said that the city was “determined to stamp out, once and forever, socialism, anarchism, communism - different labels for the same vile monstrosity”. People stood on street corners, in the middle of sidewalks, along the bars in saloons, excited and feverish, talking about the awful event of the night before. The anarchists did it - of course! No one paused to think, to question. Let it be understood by all the world that the Knights of Labor have no affiliation, association, sympathy, or respect for the band of cowardly murderers, cutthroats, assassins, stirring up the passions of ignorant foreigners, unfurling the red flag of anarchy, and causing riot and bloodshed… We hope the whole gang of outlaws will be blotted from the face of the earth. The police ‘discovered’ bombs; not only single bombs, but secret dynamite factories, whole arsenals of infernal machines. Newspapers the country over printed wild, exaggerated tales of terrible dynamite conspiracies. Editorially, the press of the country called for the blood of the anarchist agitators. A grand jury composed of prosperous businessmen indicted Fielden, Parsons, Spies, Schwab, Fischer, Engel, Lingg, Neebe, William Seliger (Lingg’s landlord) and Rudolph Schnaubelt. Schnaubelt escaped to Europe; the case against Seliger was dismissed. No criminal lawyer in the city would take their cases. The venomous press suggested that the attorney who would defend the anarchists was no better than an anarchist himself and ought to be hanged with them. Finally, three men engaged in civil practice dared to go against the hostile public sentiment of the entire country. One was William P Black, popularly known in Chicago as Captain Black, a pugnacious fellow, impressive looking, with a mop of grey hair; a serious student of public matters, sympathetic to the working class cause. Another was William A Foster, also an able man. The third was a young man by the name of Sigmund Zeisler, a foreigner recently admitted to the bar. A defence committee was formed, but contributions to the fund came in slowly, in sums from one to five dollars. Judge Joseph E Gary, at one time a carpenter, now a reactionary politician, presided at the trial which began on 21 June. The State’s attorney was the intellectual-looking Julius S Grinnel, who also had high political aspirations. 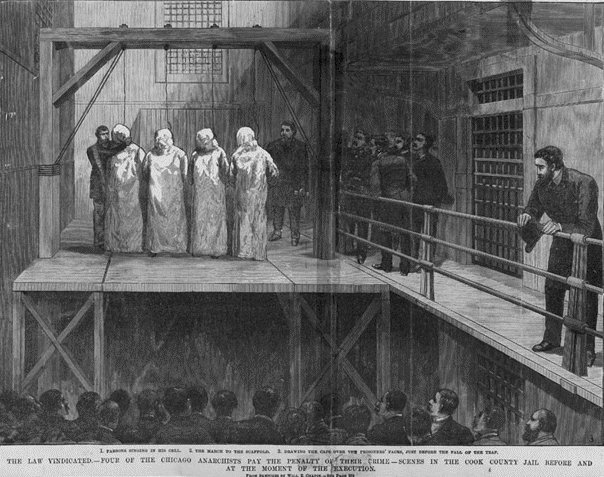 The public demanded that the accused be tried, if tried they must be, and strung up as swiftly as possible. Newspapers teemed with stories of wholesale dynamite plots. An unprejudiced jury was impossible. At least four of the 12 men finally selected admitted in the examination that they hated all anarchists, socialists and communists. The charge was murder. Not that any of the eight men were accused of having thrown the bomb, but merely that their inflammatory speeches and editorials had prompted the bomb thrower - whoever that was - to the crime. The public was satisfied that none of the defendants, with the possible exception of Louis Lingg, had personally hurled a bomb, but no one questioned that it was thrown by someone inspired by these men. The prosecution exhibited a collection of apparatus which, it insisted, Lingg had used in manufacturing bombs. On 19 August the jury found the men guilty and Judge Gary sentenced Parsons, Spies, Lingg, Fielden, Schwab, Fischer and Engel to death. Neebe, who merely owned a financial interest in Die Arbeiter Zeitung, was given 15 years in prison. When the mob outside the courthouse learned of the verdict it broke into cheers. The condemned men and Neebe were allowed to address the court. Their speeches have since been printed and reprinted in pamphlets all over the world. Today, the beautiful autumn kisses with balmy breeze the cheek of every free man, I stand here never to bathe my face in its rays ever again. I have loved my fellow man as I have loved myself. I have hated trickery, dishonesty, and injustice. If it will do any good, I freely give myself up. If you think that by hanging us you can stamp out the labor movement, then call your hangman… You cannot understand it. Well, those are the crimes I have committed: I organized trade unions. I was for reduction of the hours of labor, and the education of the laboring man, and the re-establishment of ‘Die Arbeiter Zeitung’, the workingmen’s paper. There is no evidence to show that I was connected with the bomb throwing, or that I was near it, or anything of that kind. The more the believers in just causes are persecuted, the quicker will their ideas be realized. I am one of those, although myself a wage slave, who hold that it is wrong to myself, wrong to my neighbor... for me… to make my escape from wage slavery by becoming a master and an owner of slaves myself… This is my only crime, before high heaven. I am too much a man of feeling not to battle against the conditions of today. Every thoughtful person must combat a system which makes it possible for the individual to rake and hoard millions in a few years, while on the other side, thousands become tramps and beggars. A state of society in which the only government is reason; the state of society in which all human beings do right for the simple reason that it is right and hate wrong because it is wrong. I repeat that I am enemy of the “order” of today, and I repeat that, with all my powers, so long as breath remains in me, I shall combat it. I declare frankly and openly that I am in favor of using force. I have told Captain Schaack [who had arrested him] and I stand by it; “if you fire upon us, we shall dynamite you!” Ah, you laugh! Perhaps you think, “You’ll throw no more bombs”; but let me assure you that I die happy on the gallows, so confident I am that the hundreds and thousands to whom I have spoken will remember my words; and when you shall have hanged us, then, mark my words, they will do the bomb throwing! In this hope I say to you; I despise you! I despise your “order”, your laws, your force-propped authority. Hang me for it! I venture to write and ask you to sign the enclosed appeal for mercy and so to do what you can to save the lives of seven men who have been condemned to death for a deed of which they were not guilty, after a mere mockery of a trial… I do not know if you have taken note of the events… nor can I give you a full account of my view of the matter. But I will ask you to believe me as an honest man when I say that these men have been made to pay [because of their opinions] for the whole body of the workers in Chicago who were engaged in a contest with the capitalists last year. You know how much more violent and brutal such contests are in America than in England, and of how little account human life is held there if it happens to thwart the progress of the dollar; and I hope that you will agree that the victors in the struggle need not put to death the prisoners of war they took, after having kept them more than a year in prison. William Dean Howells took the side of the prisoners. On the other hand, such American radicals or liberals as Robert Ingersoll and Henry George refused to appeal to Governor Oglesby for mercy. Ingersoll explained that, in the civil war, Oglesby had saved his life and he did not wish to embarrass him! FISCHER: This the happiest moment in my life. SPIES: There will come a time when our silence will be more.. powerful than the, voices you strangle today.